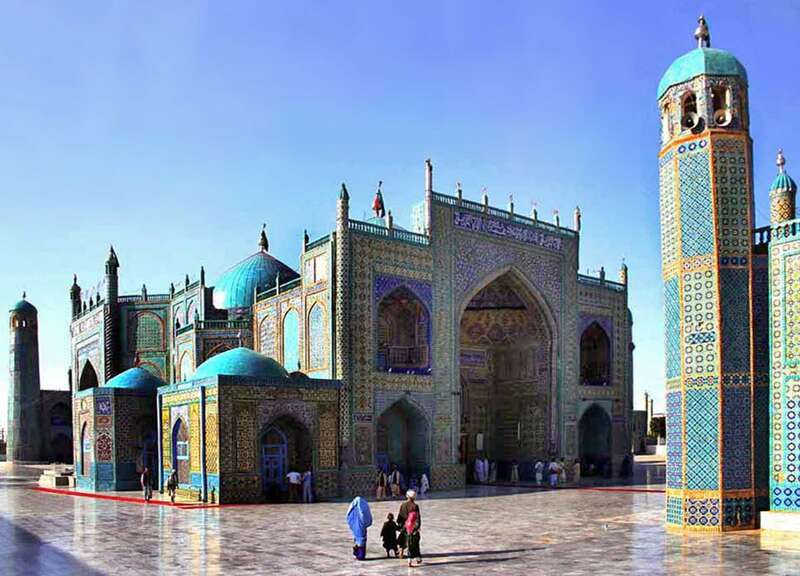 One of the most beautiful buildings in Afghanistan is Blue Mosque – Shrine of Ali in Mazar-i-Sharif. 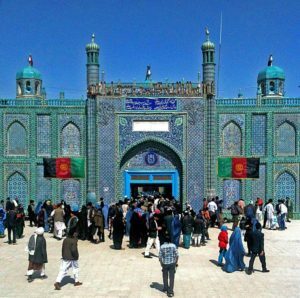 Many Afghanis believe that here is buried one of the most important persons in the history of Islam – Ali ibn Abi Talib. But some consider that this is the grave of… Zoroaster. 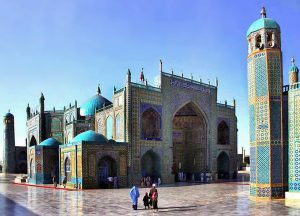 Mosque is located in the centre of the fourth largest city in Afghanistan – Mazar-i-Sharif and is by far the best known landmark in this city. Building is 53 by 38 m large and very beautiful. Blue Mosque is roughly rectangular, with the tomb chamber of the purported remnants of Ali in its center. Above the tomb rises the largest dome: 15 m wide, blue cupola. Whole building is covered with polychrome tiles. Dominating color is blue of different shades. At the mosque have been added tombs of distinguished religious and political leaders of Afghanistan but whole complex of buildings is enclosed in a precinct. One of the most prominent personalities in the history of Islam is Ali ibn Abi Talib – cousin and son-in-law of the Islamic prophet Muhammad. Ali was killed in Najaf, contemporary Iraq: he died in the 31st January 661 AD. Most Muslims consider that Ali was buried in Najaf, near the site of his death. Many Afghanis though believe to another story. According to this story the followers of Ali were afraid that his grave in Najaf would be desecrated by his enemies. His body was carried to the east by a white camel until this camel fell dead. Here Ali was buried. This grave was rediscovered in the early 12th century and a shrine was erected here in 1136. In this time started also to develop city of Mazar-i-Sharif which got its name (Grave of Sharif, Noble Shrine) from this shrine. The shrine, reportedly, was destroyed by army of Genghis Khan in the 1220s. Another legend tells that this shrine was covered with earth to protect it from desecration. Current shrine was built in the time of Sultan Husayn Mirza Bayqara (1469 – 1506) in 1480 – 1481. It these times Mazar-i-Sharif became a big and important city. Mosque was restored in the middle of the 20th century and is one of the best kept historical landmarks in Afghanistan. Not much of the original structure remains – most of the artwork here is recreated in modern times. Most Shia piligrims come here to celebrate Islamic New Year in the 21st March. There is a more exotic hypothesis: it is possible that here, in Mazar-i-Sharif, has been buried Zoroaster – ancient philosopher and founder of the first major monoteistic religion – Zoroastrianism. It is known that Zoroaster lived up to the end of his days in the nearby Balkh some 2,500 years ago. Location of his grave is not known. There is a theoretical possibility that Zoroaster lies here indeed. But most likely it is good that we don’t know it for sure. 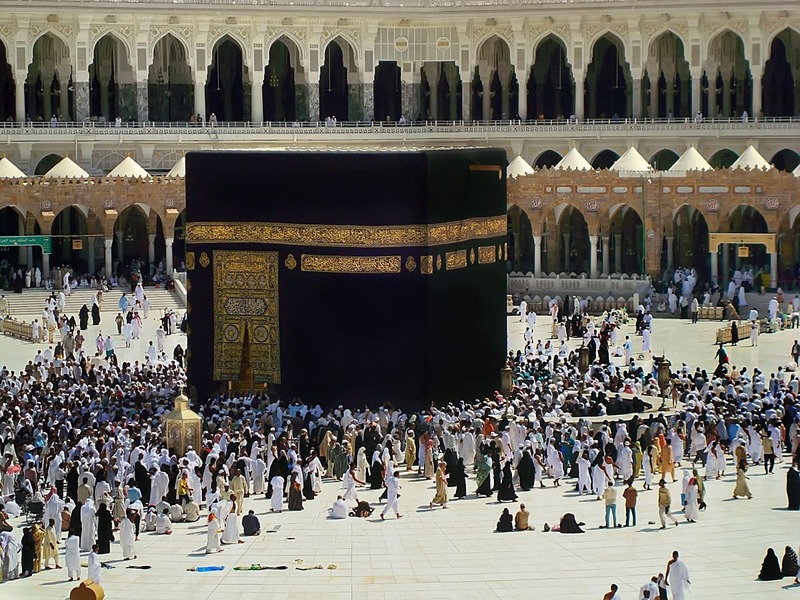 Too many landmarks of other religions have been eliminated in this part of the world. Long ago, in distant past in the area of present day Afghanistan evolved amazing cultures – here met Indian, Greek, Persian civilizations and unique local cultures. 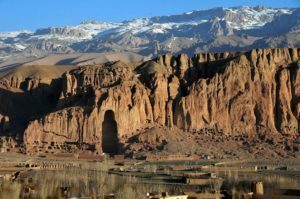 Recent decades have been harsh and some magnificent monuments of the past have been lost (including two giant statues of Buddha in Bamyan). Nevertheless many still exist. In this definitive retrospective of his work in Afghanistan,Steve McCurry has curated over 140 gripping images to present a torn, proud people, from the desert of Kandahar to the streets of Kabul and remote rivers of Nuristan. For almost four decades, McCurry traveled to the country regularly, documenting its people with a rare and disarming humanity.